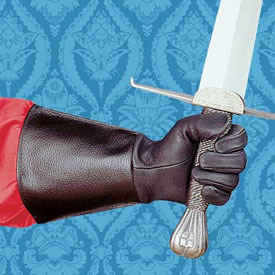 The long-cuff construction of these supple, leather gauntlets has been seen throughout the ages. Our gauntlets come undecorated to let you customize for your favorite era. The palm, hand and fingers are made of soft, pliable leather, so supple they give you the kind of flexibility you would expect from driving gloves. These dress black leather gauntlets are available in XS, S, M, L, XL & XXL (add $5.00).